The Solwise 3GWFIMRW 3.5G Plus WLAN Wall Server Router is something of a mouthful to name check, but it's a very impressive piece of hardware. 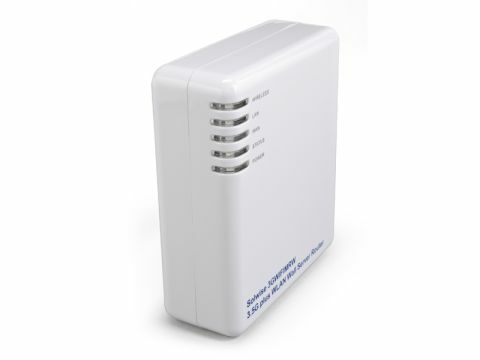 While primarily built to make it possible to share a 3G mobile internet connection between multiple computers, it can also act as a wireless access point to help extend your existing network. Plug it in, attach your 3G dongle (courtesy of your network) and you're good to go. It's a very simple process, and a great way of creating an impromptu network wherever you need one, or at least, anywhere with 3G coverage. The only real problems come from the limitations of 3G technology. Sharing a mobile internet connection between two or more computers will almost unavoidably result in slow transfer rates. Still, it's better than nothing if traditional broadband and cable isn't an option. The fact that a 3G USB dongle has to be plugged into the bottom of the device also leaves little scope for positioning to get the best possible signal, unless a USB extension cable is used. The Solwise has two USB ports included, making it possible to attach a hard drive or printer for your temporary network to share. Setting up the router is a little on the tricky side, with occasionally unclear documentation making configuration a frustrating affair. But once up and running, the Solwise Router functions well. The compact size of the router means that the Solwise will be great for travelling, enabling you to make the most of a hotel's internet connection, for instance. This device tries to please many people with its multi-purpose design, and succeeds quite well in all its aims. The price point is excellent, particularly considering the wide range of features, but be prepared to spend a little while getting things up and running.